Fruit of the vine. Yum. I’m guilty of not really paying attention to what it takes to get a bottle of wine to my table. So I asked a prominent California Delta wine grape grower and vintner if I could tag along while they labored to bring in their crush-ready crop of pinot noir grapes. 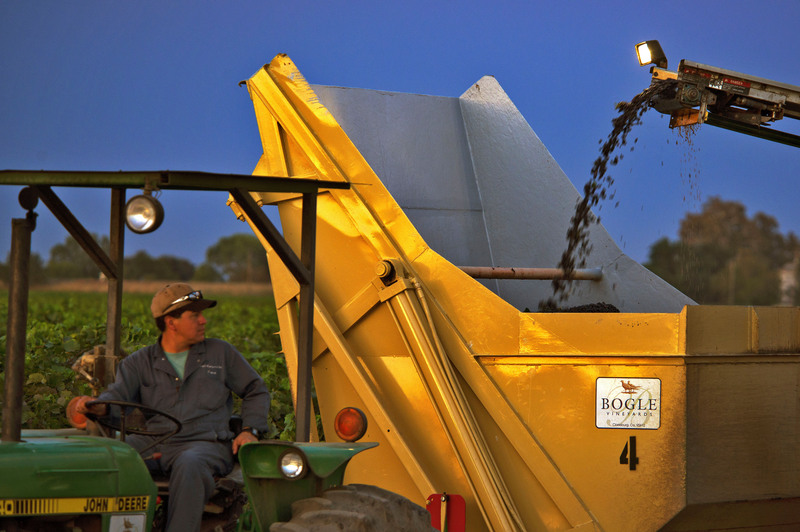 As the freshly harvested fruit is conveyed to the hopper, the driver has a tricky job and eyes in the back of his head might help. He needs to keep a speed consistent with the harvester while navigating perfectly down the rows of vines. 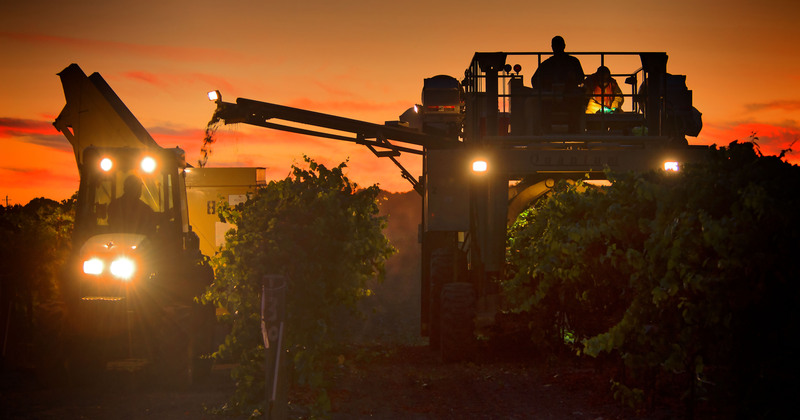 For several fall harvest seasons I’ve been wanting to chase the odd looking machines that trundle up and down rows of wine grapes in the California Delta starting in early evening. 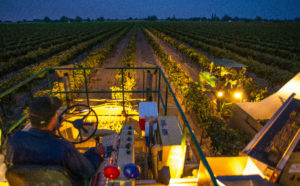 The Clarksburg area, just south of Sacramento, has a state-wide reputation, and beyond, for the quality and variety of grapes and wines produced there. It’s a part of the Delta that I wander from time to time and when I see these unusual machines on rolling stilts at dusk, headlights blazing, I’ve made mental notes to ask permission to ride along. Unfortunately mental notes aren’t worth the paper they’re written on. But this season I say to myself, if not now when? Office with a View – This harvester operator cannot pay attention to the beautiful sunset happening above and behind him while he keeps a constant speed and tracks perfectly down the rows. When most of us are just ending our work day, as the lingering heat of late fall begins to cool with the setting of the sun, wine grape growers are just beginning theirs. 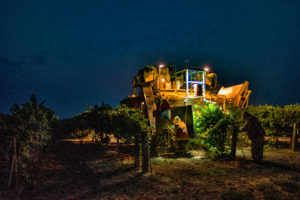 Warren Bogle, President and Vineyard Director of Bogle Vineyards, was kind enough to allow me to watch and photograph what they do after dark. He tells me they’ve been harvesting at night since the early 1970’s and there are several reasons for this. 1) The fruit is easier to handle for the mechanical harvesters, it seems the grapes fall off the vines more readily, improving the yield. 2) When the grapes cool after a long hot day their sugar content is more stable. 3) The acid level is better and there is less chance of spoilage. 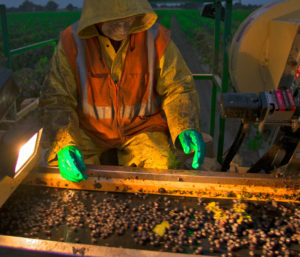 4) There is an added bonus; the workers are happier working in the cooler temperatures of the night air as opposed to the nearly 100 degrees that is usually prevalent at the time of harvest. Before the grapes reach the top of the harvester sticks and leaves have been mostly picked out by two other crew members below. Here, the few bits were previously missed are picked out before the grapes reach the hopper. Let me add one more benefit, one I’m sure the growers never considered – high noon is not my favorite time of day to be making pictures, regardless of season. Sounds like a winning scenario all the way around to me. My visits out to the vineyards started a bit before sundown and I was gifted with a colorful one. What I thought would be a simple matter of finding a good spot to watch the process was actually not that easy. These crews cover a lot of ground much quicker than I thought possible. They’ve got a job to do and that job has a deadline. This fruit needs to find its way to the crusher while it is at its peak. I have to move fast to keep up with them before I lose the good light. A crew member marks this row “Harvested” before resuming his position on the lower level of the machine. Then, it’s off into the night, harvesting until dawn. Final thought: I’ve gained a new appreciation for what it takes to bring this product to market. I’m not a wine connoisseur but I do enjoy an occasional glass or two, especially when it is well-paired with good food. In the future, when I look down the supermarket wine aisle, I believe I will be less apt to take it for granted. My thanks to the Bogle Family Winery for allowing me this ride-along. 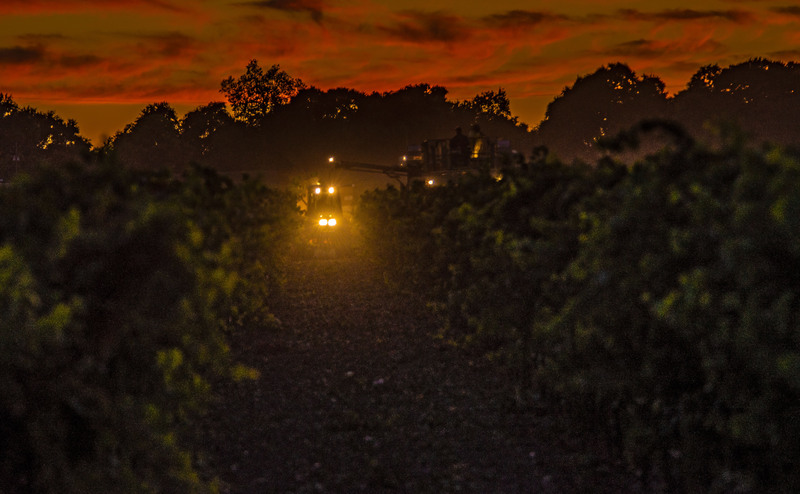 The night's cooler temperatures allow for more comfortable working conditions for the crew as the lights on the harvester pierce the darkness ahead. 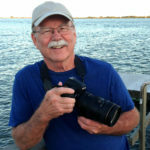 Rich Turner explored, photographed, and aerial photo-mapped Antarctica as a Navy photographer, was a newspaper photojournalist for 19 years, and has operated his own fine art photography studio since 1990. “Delta Grandeur”, his traveling exhibit, is now touring California museums and libraries. His his most recent passion is spreading the word far and wide about what an amazing place the Delta and Greater Bay Area is. With the help of very talented writers, artists and photographers, publishing this magazine seems a good way to do that. Rich, great feature story and really wonderful Sunset and nighttime vineyard photos. Best of future good fortune with the magazine! Thank you, Tim, I appreciate your kind words! Great and evocative story. I was right there with you! Thank you for your kind words, Beverly!